Today we travelled to Debrecen, by train since the bus has its stop of 45 hours. We crossed the country to the Nothern Great Plain region, one of Hungary’s poorest regions, to meet with some incredibly creative people, who are engaged in community work in a country that is bannig subsidies to all NGOs who are not stricly in line with the official governmental policies. ‘Alternative Communities Association’ is the name of the group that functions as an incubator for innovative social and cultural projects and invests in education and advocacy. They have 4 projects running at the moment, amongst which there is a radio station, a community advocacy group that engages in concrete realisations for the local people (for example, they managed to finally get a skatepark built for young people) and the Bike Maffia Volunteers, a group of bikers who deliver food packages to homeless people living in abandonned buildings in Debrecen and even in the forests surrounding the city. We learnt that the housing situation in the city for many people on low income is extremely precarious, social housing is non-existing and the rents on the private market are extremely high. Homeless people can only live in institutional shelters where they can stay only temporarily, couples are separated, pets are not allowed and you have to pay if you want a room of your own. 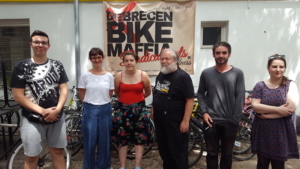 So many homeless persons don’t want to live there and that is why the bike maffia helps them to survive by at least providing food and clothing. They are thinking about engaging in ‘housing first’ initiatives, but are afraid of loosing support for their food supply if they engage in this kind of more political action. We learnt that NGOs like these are not only filling gaps left by the absence of public services, but that they even can’t get support from the state unless they abandon all critical reflections on official policies. In the afternoon, Noemi Loncsak, researcher at the University of Debrecen, gave us some background information on the social situation in the region. Above average unemployment rates, poor educational levels of the population, discrimination of the Roma who constitute a considerable part of the rural population, isolated villages, lack of prospects for new economical activities after the collaps of the old industrial sectors are characteristics of the region that do not give favourable prospects for a better future for the region. 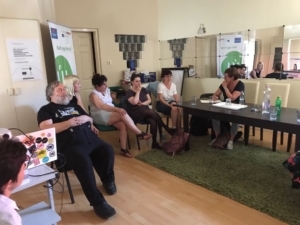 But still, during the discussion several ideas were launched for strategies that can work and we discussed about the role that decent minimum income could play in such an environment.